Fiona McCallum has hit yet another jackpot with A Life of Her Own! Alice is in the prime of her life and thinking all is right for her. She’s just completed a history degree that is all her passion; just bought a lovely new home; and has a wonderful fiancé, David. Alice thinks things couldn’t much better when she’s offered an amazing job in real estate. Unfortunately her boss has other plans. Alice finds herself in the midst of a working hell for an overachieving boss and she begins to question all she thought was good. She quickly discovers her boss is a narcissist and that it may be a sad pattern for her. She’d moved from Adelaide to Melbourne with high hopes and dreams of making a good life for herself. She escaped a fractured family and was well in her way to making her life her own. Yet this boss has sent her reeling and she finds herself in a vicious cycle of herself playing the role of victim. Luckily Alice has an amazing circle of friends who help her come to terms with her life and make some positive changes to achieve her dreams. 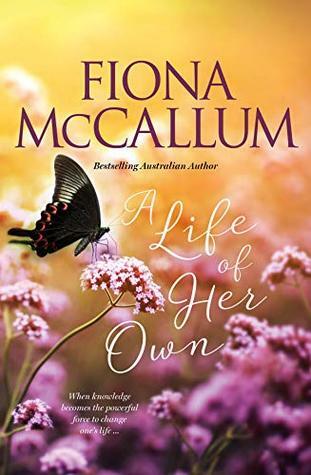 A Life if Her Own is another of Fiona McCallum’s fantastic tales of the power of friendship and love. She has a terrific way of portraying females, even while struggling, finding those who truly want nothing but the best for them. Her stories always leave a smile on my face!! My only criticism is...Ms. McCallum, PLEASE write faster!!! Sign into Goodreads to see if any of your friends have read A Life Of Her Own.